OpenCart is an online store management system designed as completely scalable and provides optimal performance. OpenCart is light-weight built using PHP and MySQL. It is open-source, free to download, modify, shape it and share it on yours. Although it is developed very earlier stage, from the Version 2.0 of OpenCart, featuring an extensive revamp of the interface. OpenCart has biggest ecommerce selections of modules and themes to expand your store functionality. It has built-in support for Multi-Store functionality and it is SEO ready nature. It has almost all popular payment gateways integrated to use and more can be implemented using plugins. With OpenCart we can help you start your online web shop quickly and efficiently. 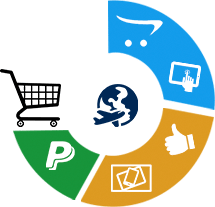 Just let us know your requirement and overview of your business we will get ready your online store where you can straight away start selling by adding products. An OpenCart custom theme can also add new flexibility, better performance and visibility, along with unique content, features and functionality. We can develop a custom theme for your OpenCart site that can increase sales, improve brand value and increase search ranking for your site. We provide best SEO solutions over your OpenCart site. We set your store SEO ready that can be indexed easily by search engines. With our advanced SEO solutions we provide you ways to create custom URLs, titles, descriptions, H1 and all that helps for best search engine visibility. Our best techniques over caching implementation help your site load faster and faster. We implement both server level caching and browser level. We make sure every object from static pages; PHP code and other dynamic pages are cached and delivered faster. However our best techniques help you update prices and other dynamic objects keep updated but still keeping them under cached blocks. Do you have any issues/bugs on your OpenCart site or you want to alter some existing functionality let’s do it for you. Our OpenCart developers with deep knowledge on this framework can get it done for you.